ScaleGen - the ultimate scale generator and editor! 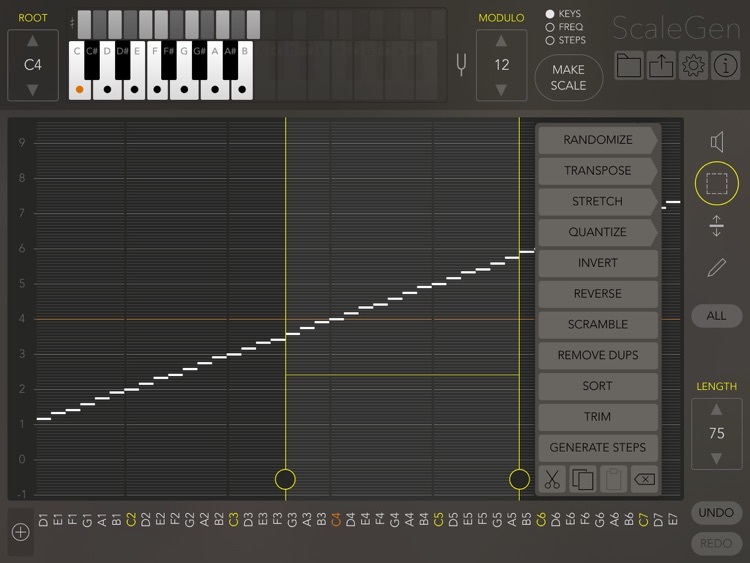 Generate and manipulate musical scales in any way you can imagine. You think you know what a scale is - think again. In ScaleGen you can do all that you would traditionally imagine when it comes to scales and pitch organisation, and then much, much more. Define or change scales in the most detailed and intricate way. Audition the scales you make from within the app or export it as a MIDI file or to our app Gestrument - the revolutionary gesture-instrument. 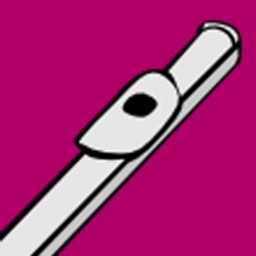 This is the tool for anyone who wants to go beyond the traditional tonalities in whichever genre. ScaleGen comes with predefined scales of all kinds - from the traditional western scales and early music (Baroque/Renaissance) scales to asian scales from India, Indonesia and elsewhere as well as more conceptual scales based in the classical contemporary music. This is the ultimate tool for experimental composers in any genre as well as for musicians who want to explore new ways of thinking about music. The educational aspects of how pitches can be organised makes ScaleGen a must have for serious music students. 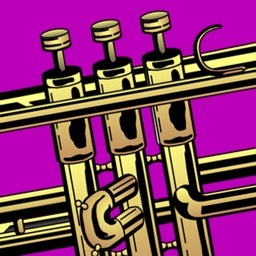 But the directness of the app makes the learning both fun and artistically developing. For most people it is a collection of pitches within one octave, with equal temperament (all half tone steps equally long) or with microtonal intonation. 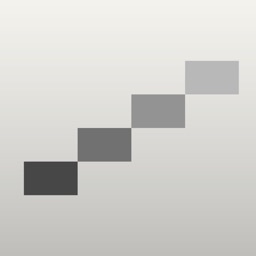 That kind of scales are of course possible to make and edit in ScaleGen which gives you a keyboard with complete control of up to 24 pitches within one octave. 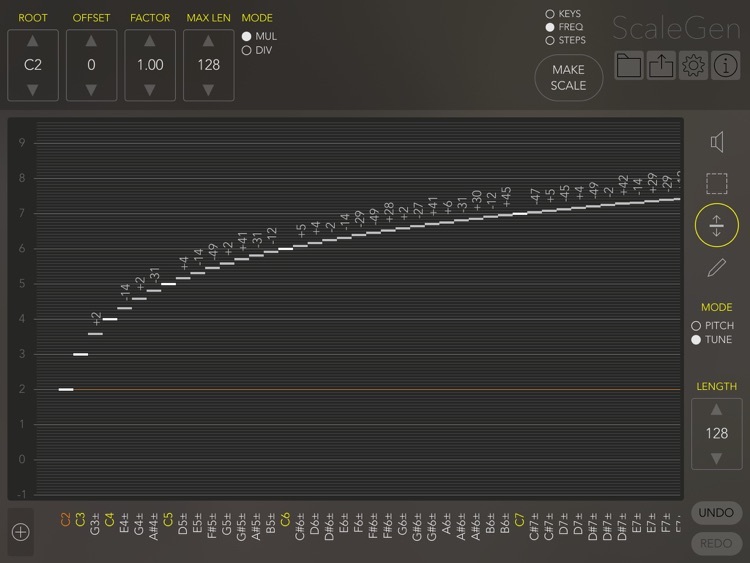 What if your scale was different in every octave? Why must a scale always go from down to up? What if you could use a variation of the overtone series as a scale? How does it sound if you divide the octave in five steps instead of twelve? 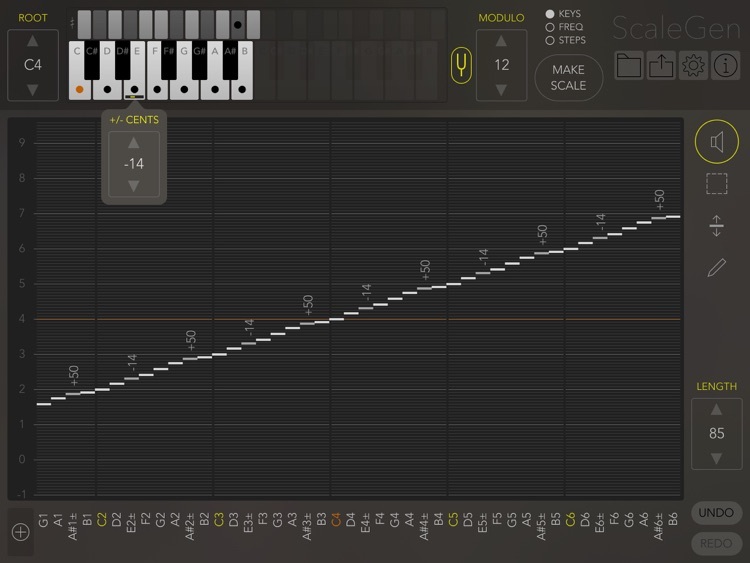 In ScaleGen we define a scale as any list of MIDI pitches that you can manipulate in many ways. You can start with a keyboard to input pitches, you can use the concept of the overtone series with multiplication of frequencies, you can define the number and size of the steps in the scale or you can import MIDI files and use them as scales. 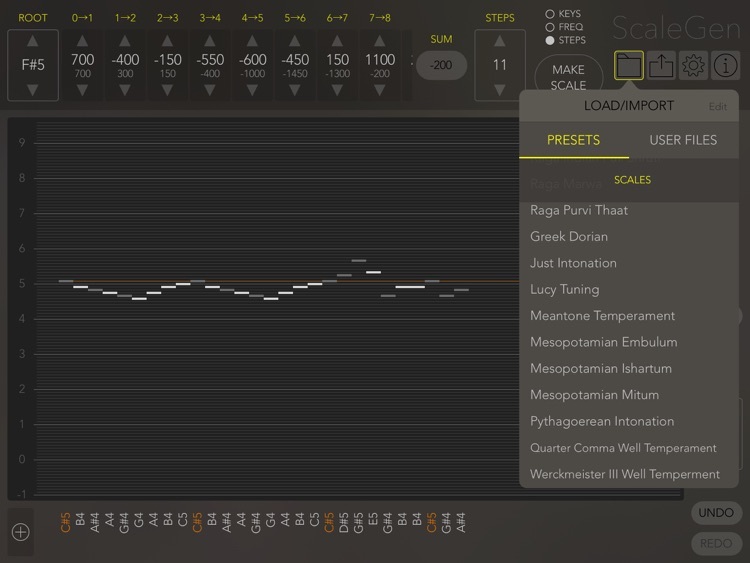 Then you can fine-tune your scale in a matrix with a number of tools. 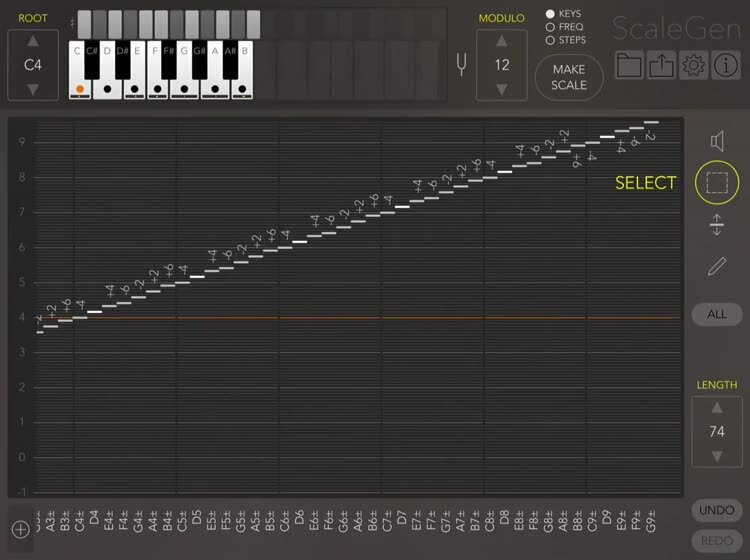 You can then try and play your scale directly in the app, using built-in sounds or control your favorite external synthesizer/app through MIDI. 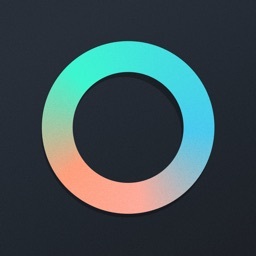 If you want to try and play on your newly created scales in another way we recommend you open them in the app Gestrument - the revolutionary gesture-instrument. 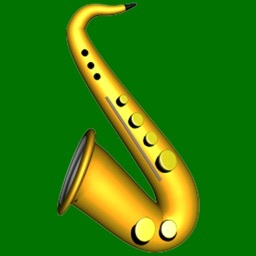 But you can also save the scales as text files or as MIDI files and open them in another program.